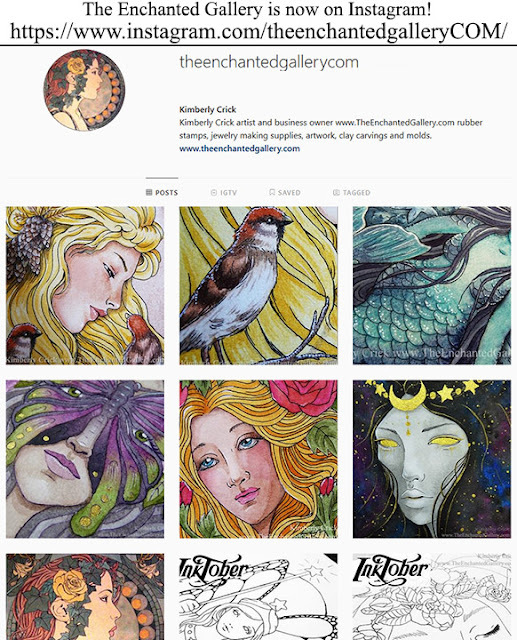 The Enchanted Gallery: The Enchanted Gallery is moving to KimCrick.com + artwork now on YouTube and Instagram! The new site will take a few months to complete as we move one item at a time over from the old site, while creating new content like a built-in art blog with YouTube videos for art supply reviews, painting, alcohol ink and other crafting tutorials. If you have feedback on the new site layout compared to the old one, please let us know! Over the years we've heard customer feedback about feeling limited to the PayPal only cart system, along with some technical errors for I-Pad, I-phone and Safari browser users. To help with that, we've made the new website mobile friendly with an improved cart system. Kim has been hard at work on her YouTube channel for art supply reviews and painting videos. If you are interested in specific craft projects, especially from our old tutorials, being turned into videos - please leave a comment on a video to let us know what to create next time. Rubber Stamps, Molds, Flexible Mold Making Compound, Jewelry Making Supplies and Artwork by Kimberly Crick. ----- How to make rubber stamped domino pendants. ----- Other projects to use your domino size rubber stamps. ----- Copic marker and other coloring methods tutorial. ----- Rubber stamping on Friendly Plastic for Jewelry Making. ----- Free paper art doll templates, instructions and stamping tips. ----- Rubber stamping on clear acrylic shapes - KrystalKraft jewelry making. ---- Example art and instructions for using flexible push molds with baked or air dry polymer clay, paperclay, utee, pmc, resin etc. ---- How to make your own flexible molds with Mold n Pour silicone molding putty. ----- How to make miniature food and other items in 1:12 scale with polymer clay. ----- Tim Holtz - Stamping, Scrapping, Mixed Media Art Genius! ----- LilyBean's Paperie - Feminine & Floral paper crafting and card making project blog. ---- Faith Hofrichter - Stampin' Up! Demo, rubber stamped card maker. Creates intricate layered die cut cards with bold vibrant color schemes! ----- Sandra Evertson - Fanciful Paper Flowers, Rubber Stamp Designer for Stampington & Co., Somerset Studio Mixed Media Artist! ----- Eclectic Visions of an Altered Journey - Stamping, scrapbooking and mixed media art. ----- Girl Gone Thread Wild - Fabric and mixed media art. ----- Star Lit Studio - Card making and rubber stamping projects! I've always wanted to help bring some beauty and magic into the world with art. After having a rough few years with cancer treatments, I was forced to drop out of college at age 22 (when at the time I meant to become an art teacher.) Instead I started a home business making my artwork available to the public as craft supplies. The Enchanted Gallery is now my full time business where I offer rubber stamps, flexible push molds for polymer clay, mold making compound, jewelry making supplies, art doll faces, dollhouse miniatures and other artwork. I promote creativity and offer free tutorials on making rubber stamped gifts, such as domino pendant instructions and paper art doll templates, along with various jewelry and polymer clay projects on my website.